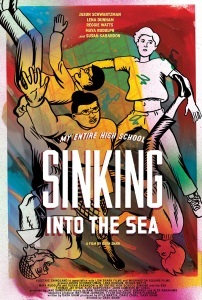 Dash Shaw's stunningly animated feature in which an earthquake causes a high school to slide off the coast into the sea, where it slowly beings to sink like a shipwreck. Can Dash save his himself, his friendship, and the school that never seemed to care for him? Starring Jason Schwartzman, Reggie Watts, Lena Dunham, Maya Rudolph, Alex Karpovsky, and Susan Sarandon. I rented this movie on a whim last night, and it was really, really charming. It's like an adolescent daydream after watching The Poseidon Adventure told through notebook doodles. Good notebook doodles! Trailer. Currently streaming on Netflix (at least in the US). A rare example of an independently-produced, feature-length animated film. I'm interested even though I can't watch the trailer right now; Shaw is a great cartoonist. Nice to know that it's on Netflix US; I tried to go and see this one at my local indie theatre last summer, but literally the moment after I bought my ticket at the box office, the electricity went out in the entire neighborhood. I didn't have time to see it on another day, so I just sort of forgot about it until now. I went to rush this at TIFF when it premiered, found out I'd completely misread the rush policy, and then the bouncer took pity on my incompetent self and gave me a free ticket, so I was predisposed to like this film. It was definitely darker than I expected it to be, but very entertaining. It felt kind of like a fever dream.